Successfully Added Infocus M810T 4G Smartphone - 5.5 Inch 1080p IPS Screen, Qualcomm Snapdragon 801 Quad-Core CPU, 2GB RAM, Android 4.4 to your Shopping Cart. The first thing that will catch your eye about the Infocus M810t smartphone is its unique and appealing design. A large 5.5 inch screen is incased in the ultra-thin 6.99mm aluminum frame, making the phone feel feather-light. There are a lot of nice details in the design. Even the small power button is made in the form of a watch crown, adding even more class to the smartphone’s elegant look. A beautiful design is not all that the phone has to offer. You will have fast and efficient 4G connectivity, giving you improved web speeds and more browsing reliability. Moreover, you will have a large selection of networks at your disposal 2G: GSM 850/900/1800/1900MHz, 3G: WCDMA 850/1900/2100MHz and 4G: FDD-LTE B1/B3, TDD-LTE B41. A large 5.5 inch 1920x1080 FHD IPS screen will let you display all the media you have on your device in great quality, conveniently surf the web and read e-books on your device as well as play games in full HD. The smartphone is powered by the Qualcomm Snapdragon 801 Quad-Core CPU, that will guarantee smooth performance and seamless multitasking as it runs at 2.5Ghz making it one of the fastest smartphone processor around. The Infocus M810T 4G cell phone comes with 16GB of internal memory, which should be enough to have your selected apps and media handy. If you are looking for loading up your smartphone with more content, don’t worry, as all you have to do is get an SD card of up to 64GB and you can enjoy a plenty of storage. With two cameras, front and back, you will always be ready to capture a fun moment or snap a quick selfie. 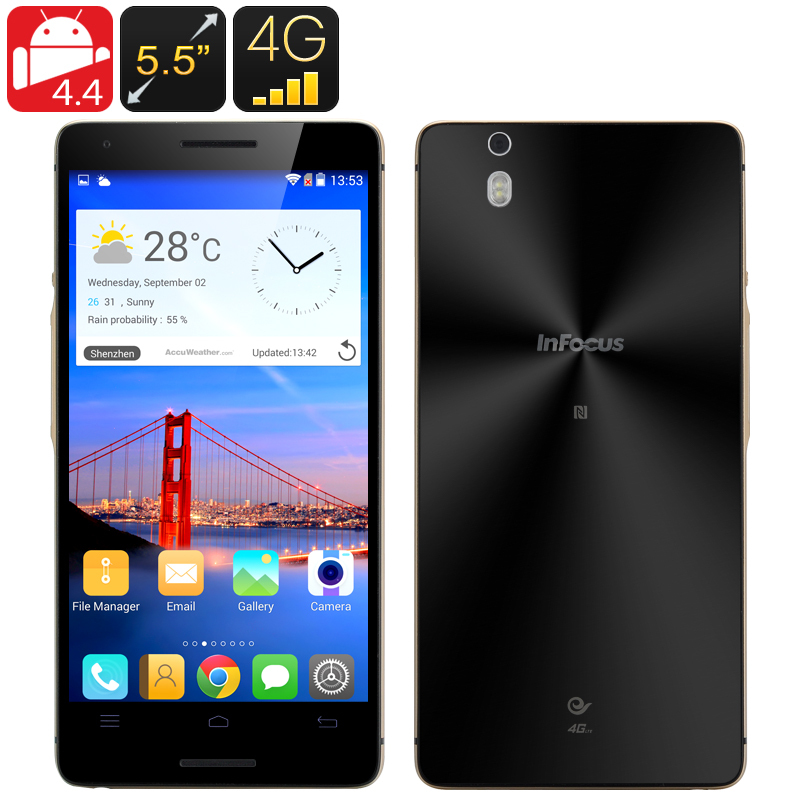 The Infocus M810T 4G Smartphone comes with 12 months warranty. Brought to you by the leader in electronic devices as well as wholesale Android smartphones, Chinavasion.. Very beautiful phone and the design is just perfect. I'm happy with my choice and I agree that Chinavasion is professional because the phone was not in stock but they respected the delivery period that was set. I highly recommend purchasing this beautiful phone that you will like it too.